Keep energized electrical equipment closed during ultrasound inspection, and easily comply with OSHA, NFPA 70E, CSA Z462 and similar electrical safety mandates. Closed-panel inspections eliminate inherently highrisk tasks, such as removing panels or opening hinged doors, making your work processes safer for personnel, plant assets and processes. Inspection ports provide direct line-of-site access to ultrasonic waves that are otherwise not accessible from equipment with tight seals. How does your facility perform ultrasound inspections on equipment that is tightly sealed or can no longer be opened while energized due to thatequipment’s voltage or incident energy rating? How does your facility inspect equipment protected by switched interlocks? Ultrasound ports provide safe access to “inaccessible” energized equipment. 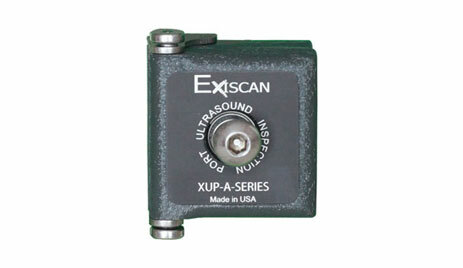 Exiscan™ Ultrasound Ports feature a conical backend to capture and focus ultrasonic waves from broad angles within the equipment. Conical front-end allows for the technician to angle data collection cones for line-of-site aim through the port of over 45º for direct access to most components in switchgear. The XUP series is built to out-live your enclosure. Our port’s body and cover are machined from half-inch bar stock aluminum. All other components are stainless steel. When it comes to durability and brute strength, Exiscan® is without peers.